Imagine the combination of the exotic cuisines of Japan, Korea, and China with the fine wines of the West? Well, you don't simply have to imagine it, for these unique combinations will be available for your dining pleasure from Dec. 1, 2005 to Feb. 28, 2006 and the COEX InterContinental Seoul's Asian Live. Combine our seven- to nine -course Korean, Japanese, or Chinese set menus with a choice of fine red or white wines for a match made in heaven. 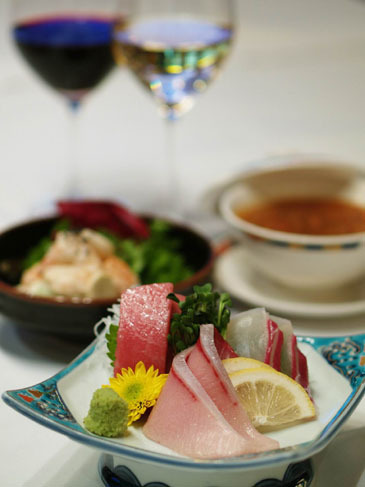 The nine-course Japanese menu begins with a daily appetizer and clear clam soup followed by deluxe sashimi. If you prefer Korean food, then enjoy our chestnut porridge, seafood with pine nut sauce, grilled beef short ribs with fresh vegetable salad. The Chinese set menu commences with shark's fin and crab meat soup followed by sautéed shrimps with chili sauce, sautéed mushroom. You can also enjoy two glasses of wine with one of these set menus. So enjoy a fine Asian meal with cossing cultures has never been this enjoyable! Asian Live is located on the 2nd floor of the hotel and Japanese, Korean, Chinese, and Indian cuisines are always available for service in combination or separately. The price for these set menus is 69,000 won (VAT and service charge not included. This offer is not available on December 24, 25, and 31.). For details or reservation call (02) 3430-8620.